Where the heck does all the time keep going?! 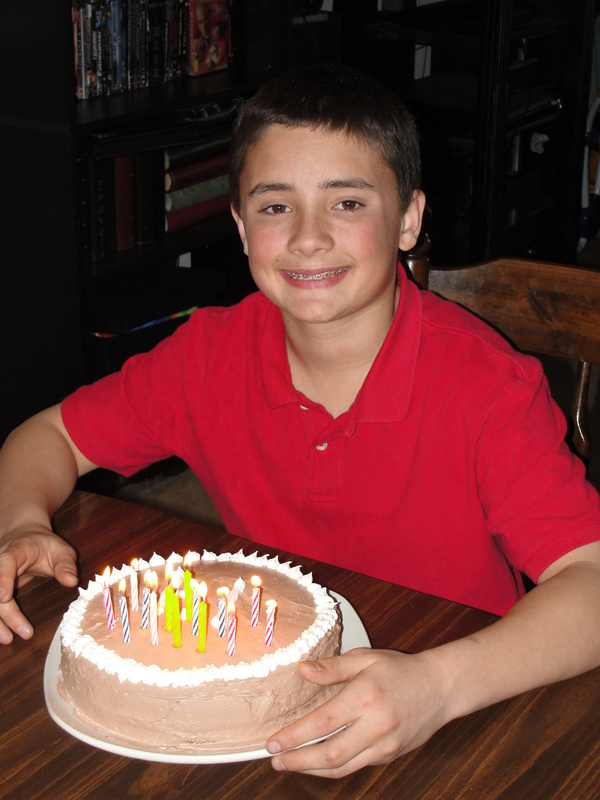 Son # 2 just turned the big 1-4. He’s our sensitive one. For several years now he hasn’t been interested in big parties or too much ‘ado’ on his day. He’s a creature of habit and prefers to keep things simple, and the same. Birthday dinner is always Philly cheese-steak subs, Mom made of course. His party is usually just family and one friend, his closest. This year we followed all his request, except for one that never came. Each and every birthday we work together, brain-storming until we come up with some new, neat cake design for one of the coolest of kids on his ‘day’. This year, it was like pulling teeth. No ideas, no wants. None. I admit, I was stumped too. Finally, FINALLY, he decided he wanted a plain cake, but he wanted something a little different than what he normally had. For son # 2 to step out of his ‘box’ is huge. A friend had recently told me about a new frosting made by cool whip. She said it was delicious, and had a lot less sugar than the regular stuff. The son heard and wanted to give the chocolate one a go. I was skeptical, but we bought a tub and went with it. 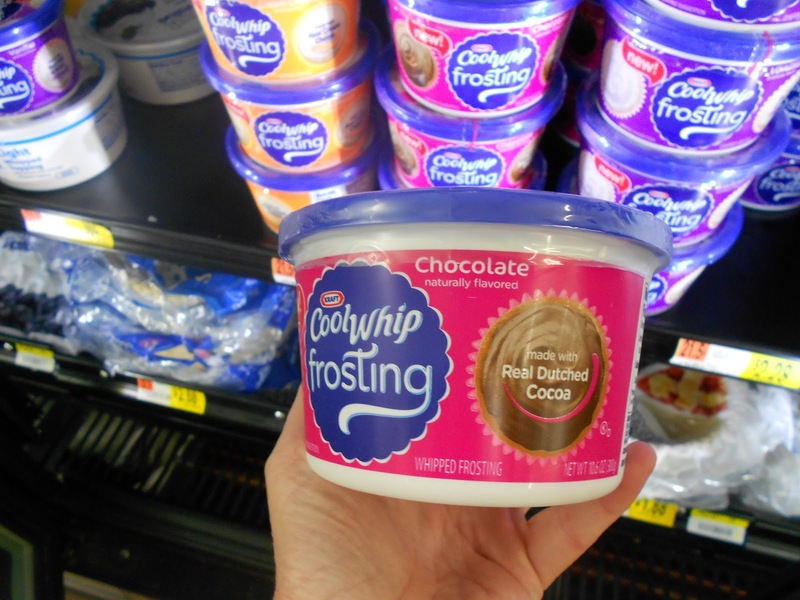 Cool Whip’s new frosting line is the real deal. Creamy, and oh-so sweet, but better for you too! It may be a ‘lighter’ option, but it’s still full of flavor. The best of both worlds! I was happy. The son was happy. And so was everyone at the party, who all wanted to know the secret of the incredible frosting. The secret was, this is perhaps the only store-bought frosting that tastes better (yes, you read that right), better than homemade. By a landslide. If you haven’t tried it yet, put it on your to-do list. Scratch that. You need to bake a cake. Today. While it cools, get to your local grocer’s and grab a tub of Cool Whip frosting. Reward yourself (we should get a reward for trying new things, right?) with a hearty slice of Cool Whip frosted cake. Or you could go the son’s route. He bought another tub with some of his birthday money. Over the next 24 hours he proceeded to eat the entire thing, from the tub, with a spoon. It’s that good. I think I’ve finally found his kryptanite. I’m thinking, ‘Will do chores, without complain, for more Cool Whip frosting.’ Thank you Cool Whip for taking the guess work out of good, quality whipped frosting. The b.b. was particularly pleased with the other ‘spread’ at his party, as well. Good food, the age-old way to any man’s heart. These chicken & waffle sliders were his absolute favorite. An entire platter disappeared in under 5 minutes. If only the queso dip would have gone that quickly! Happy, Happy Birthday my sweet boy. We love you and the wonderful young man you’re growing into. Posted in Uncategorized and tagged birthday cake, chocolate, cool whip, Cool Whip frosting, dessert, frosting. Bookmark the permalink. Has anyone else had colds, fevers, and just all-out sickness invade their home and family recently? We’ve finally fought off the ick, but for a solid week it rampaged through our house and no one was spared. Even know when we’re all technically ‘well’, we’re still physically recovering. We’ve pretty much decided we’ll be couch potatoes this weekend while we recuperate. A cup of piping hot hot-chocolate was just what the doctor ordered to help lift our spirits. This is so easy to make and by-far the richest, creamiest, most-chocolaty hot chocolate I’ve ever had. It’s perfect for fighting the blues, or even just to knock the Winter chill off. None of that pre-packaged stuff will ever give us our fix again. The cute little coolwhip toppers are the perfect little addition too. Between the frigid temps, coughs and colds, and post-Christmas stupor this is the perfect little pick-me-up. 1. 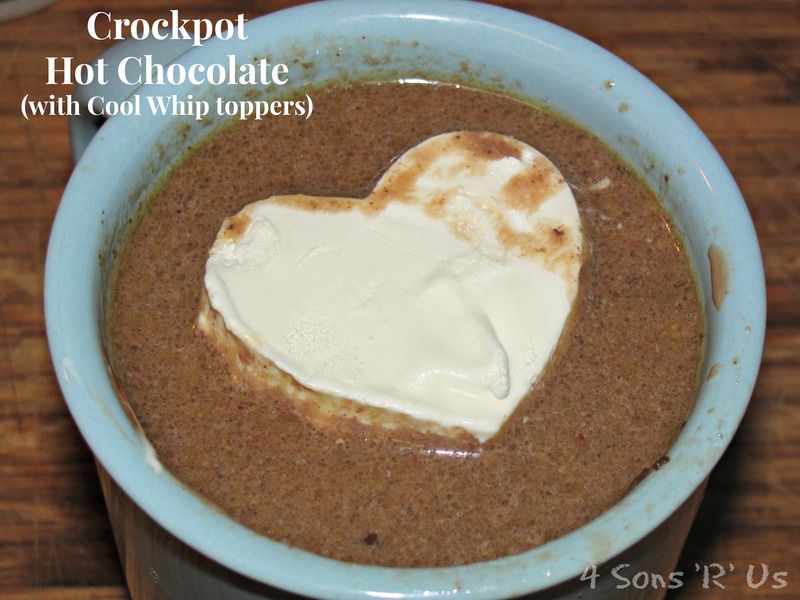 Stir together the whipping cream, milk, vanilla, and chocolate chips in a crockpot. 2. Cover and cook on low for 2 hours, stirring occasionally, until mixture is hot and chocolate chips are melted. Stir again before serving. Garnish as desired. 1. Evenly spread thawed cool whip into an 8×8 or 9×9 inch baking dish. Set in freezer and allow to freeze for at least 2-3 hours. 2. When re-frozen, remove the cool whip from freezer. Using cookie cutters, cut shapes out. Use a butter knife to gently remove the shapes away from any excess cool whip. 3. Gently place shape on top of a mug of hot cocoa and enjoy. Posted in Recipes and tagged chocolate chips, cool whip, hot chocolate. Bookmark the permalink. I scream. You scream. We all scream for Ice Cream! Well, in this case, for Frostys! My guys all go absolutely ga-ga for the cold, creamy concoction. Just mention it around them and their eyes glaze over. The excitement is just too much for them to handle. It overrides all higher functioning brain activity. They’re like little ice cream zombies at that point. Instead of watching them aimlessly shuffle around, waiting for their dessert but not knowing what to do, or how to function until they get it, I get them involved in the process. All ice-cream induced zombie-ism aside, we don’t use an actual ice cream ‘machine’. Instead I prefer using our ice cream ‘ball’. You can find them here. Amazon carries them in a variety of colors and sizes. I use the quart sized one to make enough for our entire family at once. This is what my boys do for fun on a Friday night. I enjoy it because it gets them working together: laughing, joking, and playing. At the end of their teamwork? A sweet treat to share and enjoy. You’ve gotta love the little things in life. Speaking of it being a Friday night, did I mention that I’m really not trying to drag all four kids out into a fast food line? Or even a grocery store check out line? Friday is for peace & quiet. For Mommy. I think I’ve earned a little time to relax by Friday night. Making our own Frostys at home helps buy some extra little moments for me, and the zombies still get dessert. It’s a win-win, right?! In a blender combine all ingredients. Pour into ice cream maker, and follow the machine’s instructions. 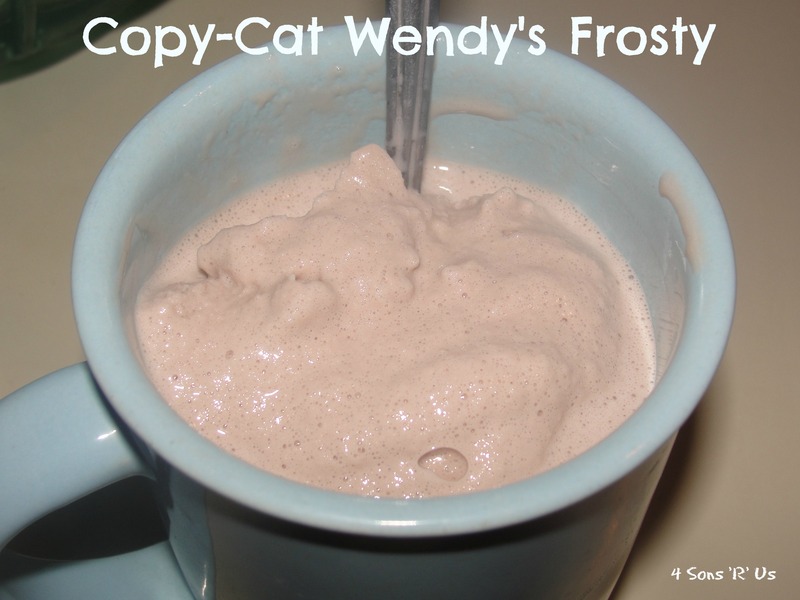 Posted in Recipes and tagged chocolate milk, condensed milk, cool whip, copy cat, dessert, frosty, homemade, ice cream, Wendy's. Bookmark the permalink.